This entry was posted in Publishing News and tagged amazon, barnes and noble, books, ereaders, nook, nook press, publishing, self-publishing by Victoria McNally. Bookmark the permalink. 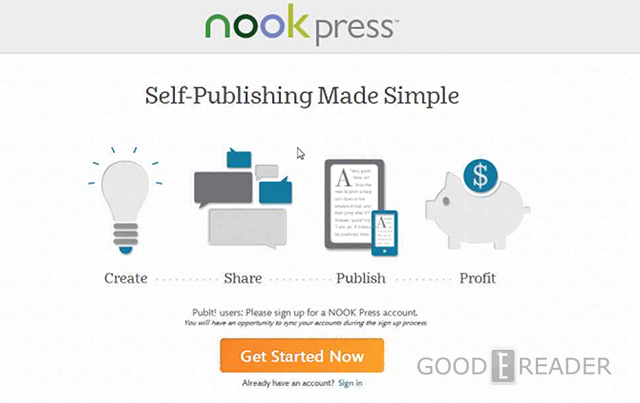 Since you’re comparing Nook Press to KDP, does that mean that Nook Press requires exclusivity for some amount of time? As far as we can tell there doesn’t seem to be any exclusivity clause for Nook publishing, but you would have to convert the finished .epub file to use on other ereaders like Kindle. We compared Nook to KDP simply because both are marketed to publishing for a very specific ereader. However, this system is very new, so there could such a requirement in place and we just haven’t noticed yet because Nook Press is so new. Time and more digging will tell if Nook will want you to publish exclusively with them for a period of time. Once we find out for sure, we’ll be sure to let you all know! Reblogged this on Self-Publish 101.